Brexit, global economic uncertainty, climate change, consumer unease with the impact retail is having on the planet. All and any of these factors can be said to be having an impact on the UK retail industry. Notably, following a damning Government report (The Guardian, 31 Jan 2019). early this year into the fashion industry’s environmental behaviour, the tides are beginning to change from consumers buying solely on low price. How can retailers navigate this rocky landscape and secure customer advocacy and loyalty? Focussing on understanding what drives loyalty and a customer’s motivation to shop with a brand in the first place can help focus marketing efforts. Mention Me’s recent second annual survey into customer advocacy and referral trends revealed that brands need to be thinking carefully about their proposition and values. If they get these right and win loyal support, customers can prove to be their best advocates and become a driver for growth through referral. Referral Marketing offers a way for brands to develop their relationships with existing customers, while new ones are introduced in an authentic way which maximises the potential for future trust. Businesses can successfully capture advocacy regardless of sector if they focus on their core audience, deliver a great experience and understand what their customers value. The Mention Me research examined which brand attributes can help make a brand referrable. The top three according to those questioned (2,000 consumers) were unchanged from 2017: great customer service, being trustworthy / credible and offering good discounts / referral offers. Loyalty came in a close fourth, highlighting the willingness of consumers to engage with brands who are able to give them a reason to purchase again. The report also revealed a rise in the ‘conscious’ consumer, less willing to engage with brands who don’t fulfil ethical codes of conduct around sustainability and workers rights. 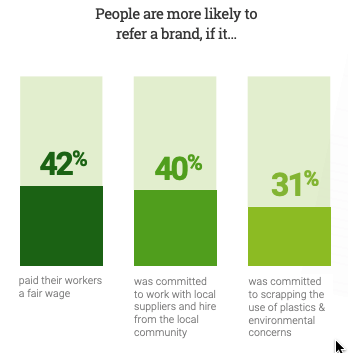 Of those questioned in this survey, people would be more likely to refer a brand if they paid their workers a fair wage, were committed to working with local suppliers and hiring from the local community and to scrapping the use of plastics and environmental concerns. This ethical focus in the minds of the consumer appears to be having an impact on the types of brands that we would be happy to refer to friends and family. March this year even saw the new people’s princess Meghan Markle speaking at the British Fashion Awards saying 2019 is the year where ‘it’s cool to be kind’ (Marie Claire, March 1st 2019). For brands it is no longer just a matter of conscience to act by ethical values, it’s become necessary for customer loyalty. This is reflected globally. A new report by JWT published late 2018, found that consumers around the world want both greater transparency and more sustainable options from brands (Warc, 25 September 2018). For retailers, the opportunity to secure cut through by focussing on genuine approaches to engage and incentivise customers is huge. If brands make efforts to get these right and win loyal support, customers can prove to be their best advocates and become a driver for growth through referral.